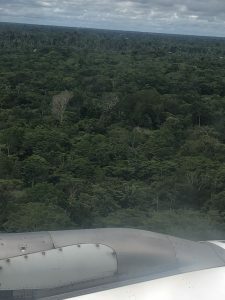 After a 5am start we headed to the airport and caught a 2 hour flight to Leticia, the capital city of the Amazonas province. Leticia is a completely different climate to Bogotá, 30 degree heat and about 90% humidity (I did some washing on the first day we arrived and it was still wet five days later). The only way to get to Leticia is by air or boat as the nearest highway is 800km away! 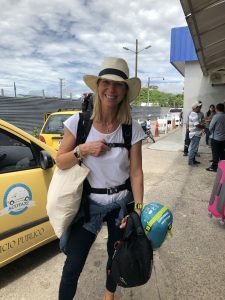 Leticia is on the Brazilian, Peruvian & Colombian boarder in the south of the country and despite being the largest city in the area it is more like a small boarder town. According the The Lonely Planet Guide, in the 70’s it was a lawless drug trafficking hub until it was cleaned up by the police but it is still the home to former narcotraffickers, guerillas & paramilitaries who have been reinserted into mainstream society! All in all quite an interesting place! We made our way by taxi from the airport to the harbour to buy tickets for the express boat to Bocana Amacayacu. It was then that it dawned on us that the taxi had driven off with the most important bag (full of ALL our critical things including all of our cash for the next couple of weeks, there are no ATM’s in the jungle)! Knowing we only had about an hour before the last boat of the day left, Jamie jumped in a taxi and headed back towards the airport to see if he could track down the driver. The chances were slim to none but after 45 minutes of driving around Jamie amazingly spotted the guy driving the other way down the road and in his pigeon Spanish asked the cabbie to turn around and chase him! Miraculously they managed to stop him and get the bag back. We honestly couldn’t believe our luck. Amazingly we made the boat, and even had time to buy a couple of very much needed beers for the two hour journey down the Amazon. 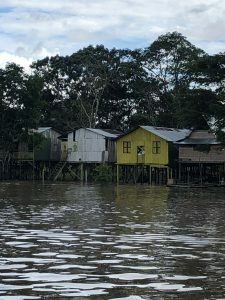 When we arrived at Bocana Amacayacu we were met by someone from the San Martin community & he took us a further twenty minutes down the Amazon on a much smaller boat to San Martin where we were staying at Casa Gregorio amongst the Tikuna community. 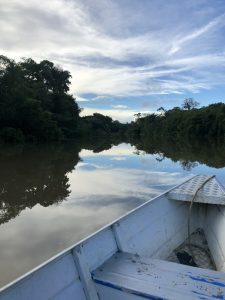 The journey down the Amazon was quite simply incredible! We couldn’t believe the tranquility & remoteness of the place, it felt such a privilege to be there and I have no doubt that it will be a experience that we will always remember. After a long and eventful day we were super happy to arrive at Casa Gregorio and be greeted by the amazing Heike & Jose, our hosts for the next four nights. We were shown around the village and then went back to the house for the most delicious supper. After supper Heike told us about the community, the Tikuna tribe and this area of the Amazon. She explained the problems the tribes encounter both with the government and religion and what their hopes and goals are for the future. 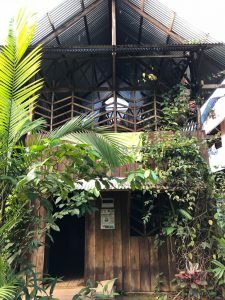 The jungle is a noisy place, particularly at night, we heard crickets, frogs, roosters and lots of other unrecognisable animals during the night. That said we did sleep fairly well under our much needed mosquito net in the amazing rustic open air cabin. After breakfast we hopped on the boat and headed about an hour and a half up the river. 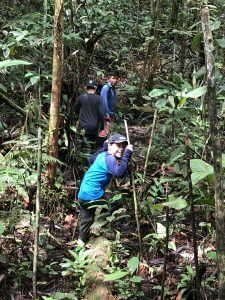 Our guide took us on a trek through the jungle and showed us so many incredible trees and creatures. 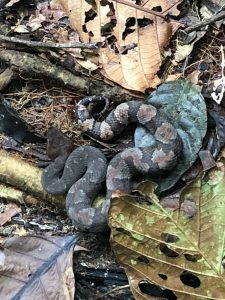 The boys were super excited to see a very poisonous snake (the four nose snake), Jamie not so! After the trek we fished for piranhas on the boat but failed miserably and then headed back to San Martin. It was incredibly hot and humid today but later in the day there was a fairly impressive thunderstorm which seemed to clear the humidity a little. While the thunderstorm was underway we did what backpackers do, chilled, read, drank a few beers, played cards & chatted to the other two lovely guests in the Casa. 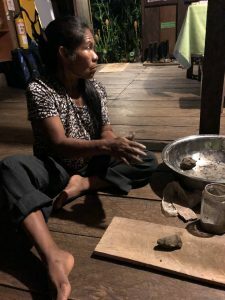 Before supper we were shown how to make ceramics by a lady from the community using the clay from the banks of the river and ash made from the bark of a specific tree. The village has electricity for only a few hours a day from a generator, no phone reception and very patchy WI-FI in one specific place in the community for a couple of hours a day (if its working!). I cannot tell you how good it is to have a digital detox… its amazing to escape the real world (the real world that we have become accustomed to), to have down time, wear easy clothes and no make up & get back to basics. The kids have massively benefited from our total undivided attention too, not having to repeat themselves to get an answer from us while we are looking at a screen! We played lots of games and properly interacted as a family. (I read this back while sitting in a modern apartment with (patchy) Wi-fi and I have already noticed the difference, the kids have started arguing again, we aren’t properly listening to them and they keep asking for our screens for entertainment, which we are resisting… take me back to the jungle)! 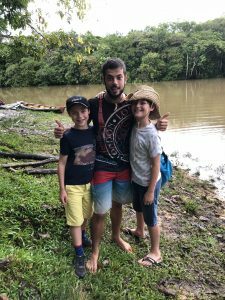 One of the things we noticed massively is how amazing everyone has been with the boys, they have been welcomed by everyone and in fact are a novelty to fellow backpackers. 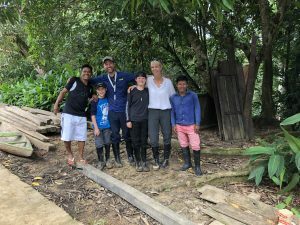 We have been so impressed with the way the children have interacted not only with other travellers but also with the children and adults within the community. It is very apparent that the boys have already taken so, so much from this incredible experience and its an absolute joy to watch and quite possibly the best education they could have. So last night was an entirely different kettle of fish in terms of night noise in the jungle. It was Mother’s Day and boy do the Tikunas know how to celebrate… they partied hard until 5am! As all of the cabins and houses are open air you can hear pretty much every word that is said, particularly music on a loudspeaker with the same four songs on repeat ALL night! It did make me feel a tiny bit guilty about some of the parties we have had at home with the boys trying to sleep upstairs! I’m sure it wont stop us though! Anyway, Monty and I actually slept reasonably well considering. Unfortunately I cant say the same for Jamie and Alfie. After breakfast we hopped on the boat and headed to Puerto Nariño, a pretty little village about 20minutes down the river from San Martin. On our way in and to our great excitement we saw some pink river dolphins swimming fairly close to the harbour. 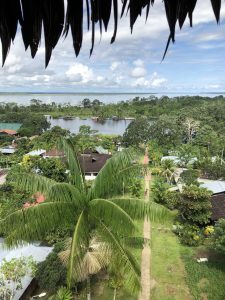 In Puerto Nariño we went up the watchtower which gave us a fantastic view of the Amazon & the Peruvian boarder. We ate delicious homemade Mora and Açai ice cream (local fruits) and then headed back on the boat & headed off to the flood plains. In the summer they dry up almost completely and provide fertile land for fast growing crops. In the rainy season they are home to fish, dolphins, manatee and lots of incredible birds. In the flood plains we went to a huge lake where we saw more amazing pink and grey river dolphins. 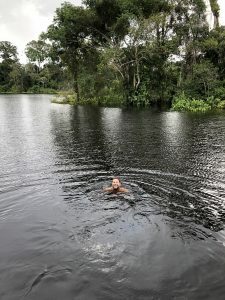 We then swam in the Amazon black waters amongst pirahans and dolphins which was an absolute highlight for me. We headed back to Puerto Nariño for lunch and had the usual but delicious plata del dia which generally consists of chicken soup to start followed by meat or fish, rice, plantain, yuka, occasionally potatoes and a small salad. After lunch we headed back to San Martin. There were a few new guests at Casa Gregorio, including two absolutely lovely Dutch girls who were amazing with the boys. They taught them new card games which they played for hours. We also met a Spanish volunteer who the boys thought was totally awesome, not sure he liked it but Monty called him Gizmo, his real name was Guillermo. 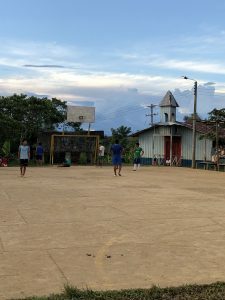 We wandered around the village and watched a football match which seems to be the daily social event. The men and boys take it in turn to play (and they are seriously good, particularly considering how hot it is) and the families sit and watch. Later on we headed back down to Casa Gregorio for another yummy supper. 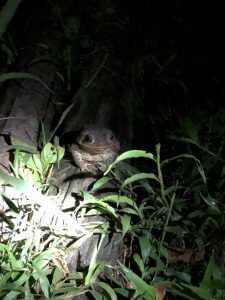 After supper we went with our guide on a night trek seeing lots of bugs and grubs, some fairly enormous spiders and equally large frogs (but still not as large as the hand sized huntsman spider we saw in the bathroom)! Much to the delight of the boys, everything in the Amazon seems to be super sized! After an amazing day and with two very sleepy but content boys we headed to bed. Our last day in the jungle and today we were off to see monkeys. After a delicious pancake breakfast we got on the boat and went to Mocagua, the next community down the river. We walked fairly deep into the jungle to a monkey rehabilitation centre. The centre helps monkeys back into the wild that have been illegally trafficked or kept as pets. It was a fascinating morning which the boys loved. We had lunch in the community and then headed back to San Martin. 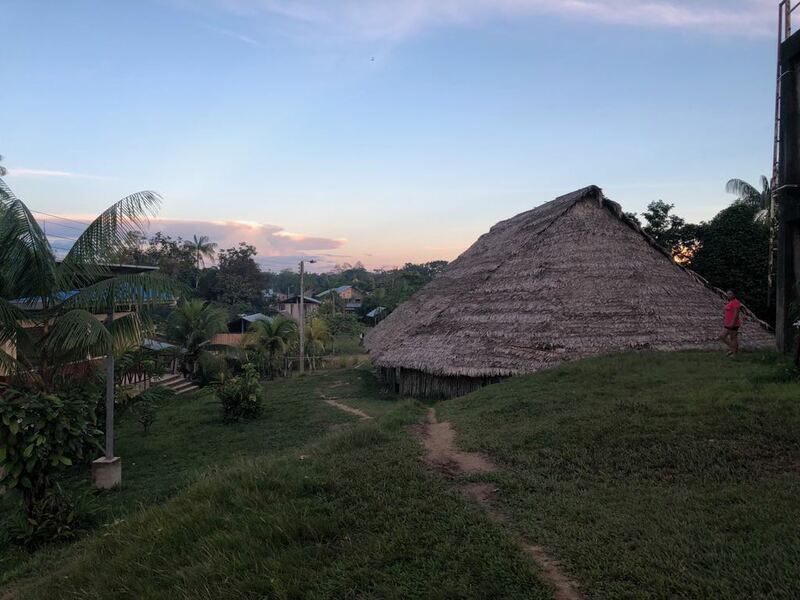 We spent the afternoon hanging out with the other guests, and learning more fascinating information about the community, other local tribes and the Amazon. We were given a Tikunan delicacy with our supper, roasted queen leaf cutter ants! You can imagine the boys reaction! Alfie loved it, Monty not so much. I actually didn’t think they were too bad. Our stay at Casa Gregorio has been utterly incredible, totally humbling, very authentic and grounding, and is certainly something we will never forget.